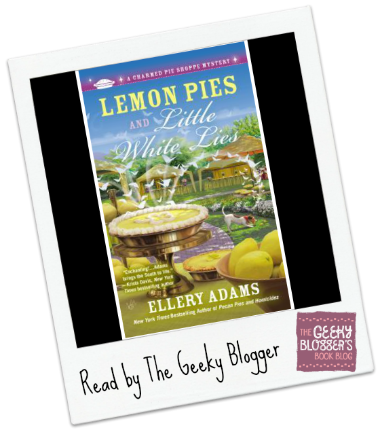 First Thought when Finished: Lemon Pies and Little White Lies by Ellery Adams was a really good read (just had a little problem with the end). Overall Thoughts: The Charmed Pie Shoppe Mysteries are probably one of my favorite cozy mystery series–PERIOD! I really love Ella, her family, and friends. I am not a fan of Hugh which is probably part of the reason this one isn’t my favorite in the series. The mystery is strong. The town is delightful as ever. Her love life and the end of the story was the only thing that kept me from rating it higher. However, this series is still way worth the read. It really does rock! This book wasn’t my favorite but I’m still really enjoying the series! I’ll still be picking up the next book and I’m excited to start in her back series. This is an awesome cozy series. 🙂 Thanks for sharing your thoughts! I am so behind on this series but I loved the 1st! So need to pick up the rest!!! Mmm lemon pie! Will have to check this series out! First time I hear about this series/author, but I’m in the mystery mood, so it’s perfect for me. I’ll check it out. I read book two just a couple of months ago and I agree, the romance really bothers me. I could care less. You had me at Lemon Pie! I had not heard of this series, thanks for bringing it to my attention. I have just discovered Ellery Adams as I’m recording her BOOKS BY THE BAY series for Tantor. This one is fun for me in particular because it’s set near where I live in NC, but I’m enjoying her writing as well. I think she does a great job with the cozy genre. She is awesome! I requested her Books by the Bay series. She has an awesome fun voice and her mysteries are super solid! 🙂 This series is an auto-buy so I am sure her other one will be too!